Paddle your sea kayak through narrow waterways rich with wildlife and circumnavigate three beautiful and undeveloped islands. 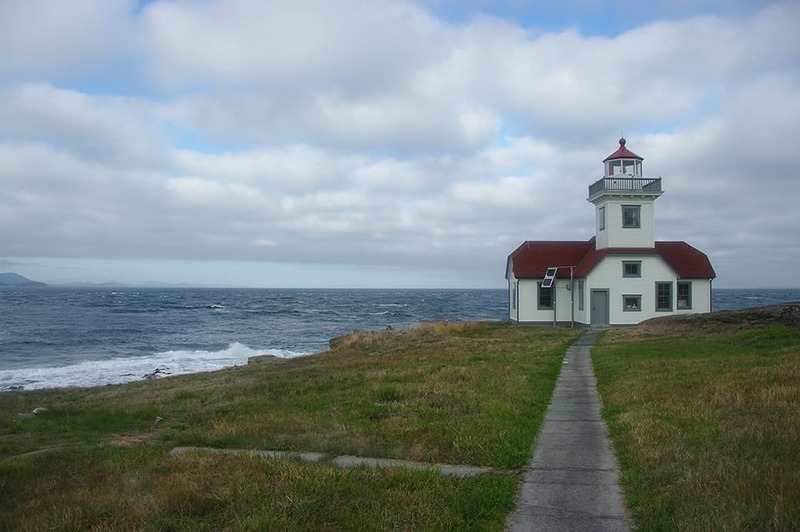 Stop at a historic lighthouse and take in the views of surrounding islands and the Olympic Mountains while learning a little bit of Washington State history. Search for pods of Orca whales that frequently make appearances here. This trip has it all. A convenient location, lots of wildlife, fun and professional guides. Join us! 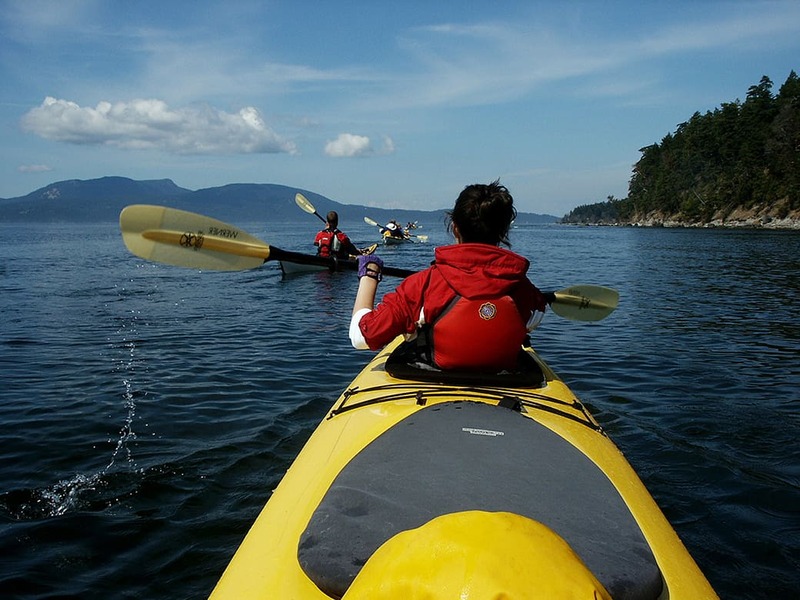 You don’t have a lot of time and you want to try sea kayaking in the San Juan Islands. Skip the ferry hassle to Friday Harbor and join us on a fun 5-hour guided kayak tour that departs directly from Anacortes, on beautiful Fidalgo Island. Your Home Port to the San Juan Islands of Washington State! 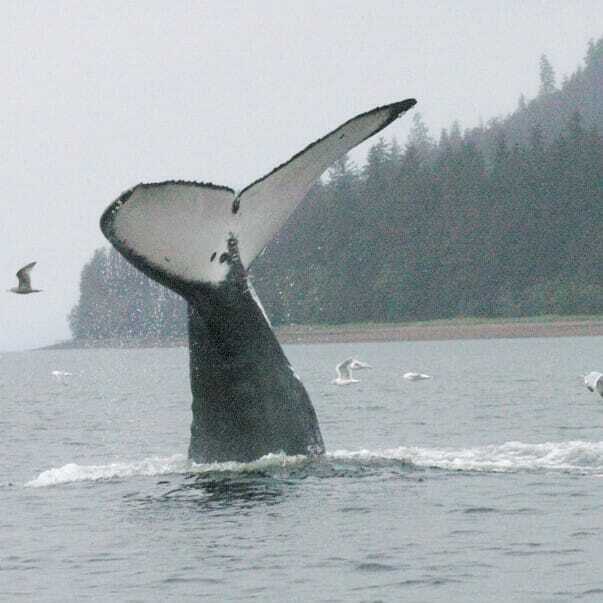 Excellent wildlife viewing possibilities; Seals, porpoise, Bald eagles, Orca whales, deer, and more! Beautiful scenery; Olympic Mountains, San Juan Islands, Mount Baker, and the Cascade Mountains. Undeveloped shorelines and quiet waterways. Avoid the crowds of San Juan Island. Save time, save money. During the summer months the San Juan Islands ferry can often become more of a burden than a blessing. Crowded boats, schedule delays, and the added expense can take the fun out of your day. Anacortes is located on beautiful Fidalgo Island, the only island connected to the mainland by bridges, and you can drive directly to us. You get more time on the water and you won’t have to worry about a ferry schedule to return home. The small islands, and the Williamson Rocks National Wildlife Refuge, that you will be exploring provide a protected area that is favored by seals as a pupping ground. During the summer you will be treated to fun views of these curious little creatures as they sometimes approach the kayaks. The narrow waterways around Burrows Island are also home to a well-studied population of Harbor porpoise, one of the largest herds in the San Juan Islands. As you float quietly in the water you can often hear their sharp exhalations echo across the surface, and unannounced close encounters are frequently experienced. In recent years the population of Transient Orca whales has exploded in the San Juan Islands, and the waters near Anacortes have suddenly become a hotspot of activity as the whales patrol the area hunting for food. Although we cannot predict when or where they will appear, we’ve been excited to report many sightings on these kayaking excursions, so keep your eyes open! Aside from the marine mammals, you are very likely to see Bald eagles, Peregrine falcons, and a variety of interesting sea birds living here. There are also many fascinating undersea creatures to learn about. 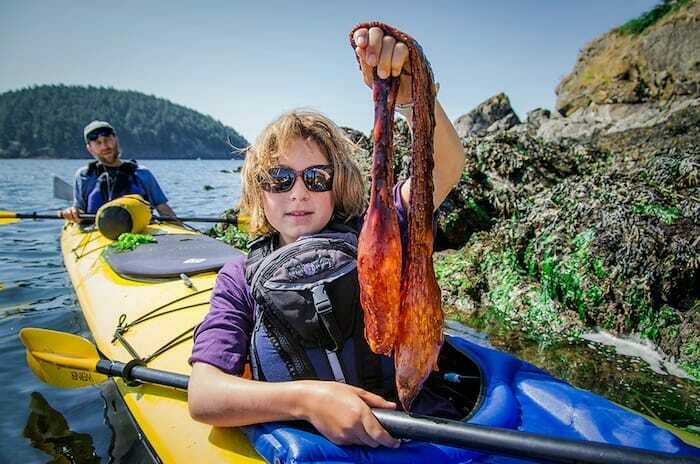 On low tides a strange new world becomes exposed to kayakers and you will love to see these fascinating animals. The San Juan Islands are one of the top destinations for visitors to Washington State for a good reason. The entire area is gorgeous! Kayaking from Fidalgo Island you will be treated to views of the Olympic Mountains, which rise dramatically from the sea. Across the water the high forested slopes of the Cypress Island Marine Reserve dominate the scene, while the low hills of Lopez Island protect you from weatherl rolling in from the Strait of Juan de Fuca. The beauty isn’t limited to distant landmarks however. The islands you will be exploring are undeveloped and wild. Rocky cliffs topped with grassy slopes give way to tangled forests of evergreen trees and flowering shrubs. The water here is often a deep emerald green, almost tropical in appearance on certain days. And rising out of the depths are vast undersea forests of kelp which are home to an array of sea creatures and provide a protected rest area for seals and kayakers. Like all of our tours, this 5-hour sea kayaking trip requires no previous paddling experience. Your professional guide will take care of the details so that you can relax and enjoy the trip. We have designed our day trips to be comfortable and fun outings. The goal is not to cover vast territory, but rather to move slowly and take in your surroundings. After all, the slower you go the more you will see! If you would prefer this to be a more strenuous activity then please give us a call. We may possibly be able to arrange a trip that suits your needs. Anacortes Kayak Tours is currently the only outfitter in the San Juan Islands to offer the choice of single kayaks or tandem kayaks for our guests. While tandem kayaks are the more comfortable choice for most people, we understand that some folks want to paddle their own kayak. If you choose a single kayak we recommend that you be in moderately good physical condition because you will not have a partner to help you propel the kayak. Supplies of single kayaks are limited so you should reserve early to ensure that you can secure one. Please feel free to call us if you have any questions or concerns. Bring a picnic lunch to enjoy. There is a historic lighthouse perched on the western edge of Burrows Island. It is a favorite place to stop and take a break. Stretch your legs and climb up to the grassy field where you can take in spectacular views of the surrounding islands as well as seals and porpoise frolicking offshore. There will be ample time for a bite to eat, or perhaps a short walk to a hidden lookout over one of the narrow channels in between the islands. For our 5-hour Sea Kayak Trips please meet 30 minutes prior your scheduled departure at our store (2009 Skyline Way) in Anacortes, unless instructed otherwise by our office staff. We are located just past the San Juan Island Ferry Terminal, in Skyline Marina. Check in with our friendly office staff and you will receive your parking pass with directions to the parking area across the street. After parking you will be greeted by your guide who will outfit you in your lifejacket and offer you a dry bag for your personal items. After some brief introductions your guide will lead you down to our custom kayak docks. Here you will be comfortably fitted into your chosen kayak and participate in a quick safety briefing and kayak instruction. Now it’s time to launch! Kayaking out of Skyline Marina gives you plenty of time to settle in and get comfortable before entering the open water. Further tips on paddling technique can be delivered to you here if you desire, just ask your guide for more instruction. The first body of water you enter is Burrows Bay, the protected area nestled in behind Burrows, Allan, and Young islands. You’ll be treated to nice views of the western shorelines of Whidbey Island and Fidalgo Island, and also a peekaboo view of the rest of the San Juan Islands through a narrow channel to the west. Because this kayak tour departs many different times throughout the day the route changes frequently. Your guides are very familiar with the tidal currents flowing through the islands and will plan your route accordingly in order to maximize your enjoyment. Most trips circumnavigate Burrows Island during the trip. Fast groups may kayak around all three islands, but that is an infrequent event. Occasionally the group dynamic or the prevailing conditions may prevent a complete circumnavigation. Your guides are always working hard to provide you with the best possible experience and to bring you to places that offer the most rewarding wildlife viewing. If you have any specific expectations or desires then please let us know when you are booking the trip. We can help make sure that we get you on the most appropriate departure. We will make a stop sometime during the middle of the trip for a beach break. Bring a sack lunch and enjoy a picnic on the island while you stretch your legs and take in the beautiful scenery! You will return to the same kayak docks that you started the trip from. Your guide will be able to then assist you out of your kayaks before escorting you back up to our facility. 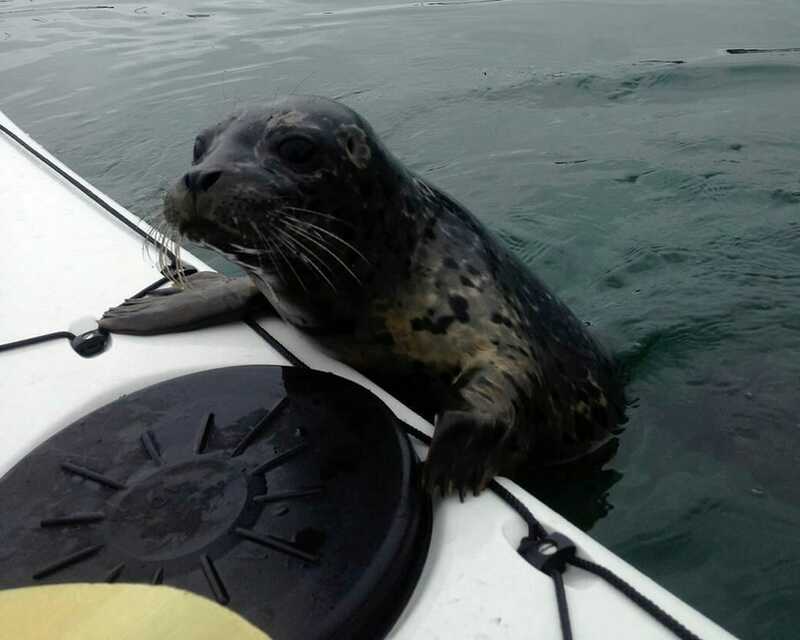 We hope that you enjoy your experience, and we thank you for choosing Anacortes Kayak Tours! Over the years we have been hearing from some of our guests that they would prefer to use a single kayak for their trip. Although our tandem boats are very comfortable, stable, and the best choice of most of our folks, we understand that there are some of you that would prefer the experience of paddling by themselves. Currently we are the only kayak tour company in the San Juan Islands that offers the use of single kayaks on our tours. There is a limited supply of them that may be reserved on a first-come, first-served basis basis. We feel comfortable doing this because our trip leaders receive safety training that is far more comprehensive than the current industry standards for the area. They are prepared to ensure your comfort and enjoyment of the trip. As we continue to grow and develop this new program we encourage your feedback so that we can provide the best possible service to our guests. Please do not hesitate to contact us with any questions or concerns. Thanks! Please read the following information carefully as it contains important things that you need to know about reserving single kayaks. The use of single kayaks on these trips will only cost more if a guest asks to reserve the use of one. Some trips will have singles present in order to accommodate odd numbered groups. In these cases there is no extra charge because we prefer that our staff lead the tours from their own single kayaks for safety reasons, and to be able to interact with participants more efficiently. If you specifically reserve the single kayak then we will be booking the trip accordingly which will reduce the size of the group, and the availability of that single kayak for others to use. Due to the limited supply of singles in our fleet, and a limit on the number of kayaks that we are allowed to use on each trip, we feel that to be fair to everyone a reasonable surcharge is appropriate. Who is best suited for use of our single kayaks? Experienced kayakers who don’t have access to a boat, or are interested in building local knowledge of the San Juan Islands. Novice kayakers who have paddled before and are interested in learning more kayaking skills. Totally inexperienced people with reasonable athletic abilities, moderate fitness, and a taste for adventure! Unless prior arrangements are approved, the use of single kayaks is limited to guests 18 years and older. For your comfort and enjoyment of the trip you should be moderately fit, reasonably athletic, and have no physical limitations. Paddling a single kayak is a bit more work than when you have a partner in a tandem kayak and keeping the boat tracking straight is not as straightforward in the smaller boats. Also, your sense of balance should be fairly well developed as the single kayaks are not as stable. Capsizing is more likely when paddling a single kayak, so you should be prepared for that possibility. We do have wetsuits available for people who want to be ready for immersion, and we highly recommend that you use them (some days it may be required by your trip leader). Our individual weight limit is 225 pounds and 6’2″ in height. Larger folks may find the boats to be slightly uncomfortable for the duration of the trip. Please call if you have questions about this, these limits are not “carved in stone” but are guidelines that we have found to be fairly accurate. Our guides are very good at Risk Management and we trust their judgment. If a trip leader feels that any individual may compromise the safety of the trip then they may be asked to join the tour in a tandem kayak (at the lower rate), or receive a full refund if they choose not to go. Thank you for understanding! If the prevailing weather or tidal currents create conditions that might compromise a guest’s security in a single kayak then we reserve the right to cancel the reservation of that boat. Participants will be offered the use of a tandem boat, at the lower rate, or be offered a full refund if they choose not to join the trip. Again, thank you for understanding, your safety and comfort is our primary concern! We have a limited supply of single kayaks, so reservations are on a first-come, first-served basis. We may not be able to facilitate all requests. Environmental conditions (weather, etc) may preclude the use of singles on a trip, this decision is at the discretion of AKT management and AKT trip leaders. In the event that we feel that we cannot use single kayaks on trip participants will be invited to use our more stable tandem boats, at the lower rate, or be given a full refund if they choose not to go out. Please know your limits! If AKT management, or AKT trip leaders, determine that an individual will compromise the safety of the tour then the participant may be asked to switch into a tandem kayak. Be aware that this may occur at any point during the tour. In these cases the participant will be reimbursed for the cost of the single kayak and be charged for the use of a tandem instead.